The new Maxwell GPU is exactly what you’d expect from a modern mid-range graphics card. It nails 1080p gaming performance, wont tear into your wallet like an angry badger and does it all within a decent thermal and power envelope. I can't help but feel underwhelmed, though, which is surprising given how excited I’ve been about the previous Maxwell-based cards. That's even despite the fact I’ve got one of the most overclocked versions of the GTX 960 sat in my test rig: the EVGA GeForce GTX 960 SuperSC. After witnessing the excellent GeForce GTX 970 far outstripping its predecessor, the GTX 770, the GTX 960’s GPU feels like it’s been designed to only put in the bare minimum of effort. The GeForce GTX 960 is a generational update to the outgoing GTX 760 and, while it consistently bests it’s forebear across my gaming benchmarks, it doesn’t really do it by any particularly impressive extent. As Nvidia themselves have said to me though, they don’t really see this part as an upgrade from the GTX 760—it's intended for those who are still sitting on either a GTX 660 or GTX 560. That is though a pretty hefty demographic, according to Nvidia. 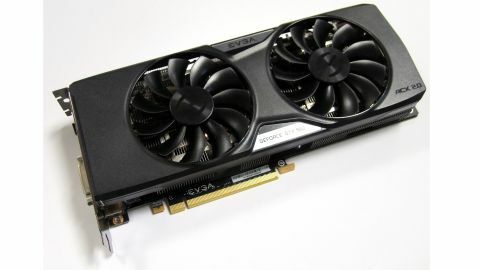 They assert that two of three PC gamers are currently running a GTX 660 or older. These people are going to need to upgrade their cards soon for the next glut of games and, if they’re sticking in the same price range, then the new GTX 960 is surely going to be the card for them. For the GeForce GTX 960 Nvidia have created a new iteration of the Maxwell GPU. The GM 206 is their mid-range Maxwell chip and houses a total of 1,024 CUDA cores spread across eight SMMs. With that comes 64 texture units and some 32 ROPs. Compared with the Kepler GPU Nvidia used in its GTX 760 that spec’s actually looking a little miserly. The GK 104 chip had a full 1,152 cores across six SMX units with 96 texture units and the same 32 ROPs. The Maxwell streaming microprocessors (SM) are made up of 128 cores in each opposed to the 192 cores of the old Kepler architecture, but the more efficient new graphics tech is able to nail the same performance with fewer cores. Considering the GTX 970 still threw in a whole extra SMM unit worth of CUDA cores into its recipe I’d hoped for a bit more oomph in my GTX 960 spec. What we do have though is a much higher clock speed. The older card’s base clock was 980MHz, but the standard GM 206 is set at 1,126MHz with a 1,178MHz boost clock. In practice with this EVGA GTX 960 SuperSC card though I never saw the GPU running at those apparently-conservative speeds. My review card was consistently hitting between 1,417MHz and 1,430MHz. And even when the EVGA card was powering along at that speed it was never loud. The peak temperature I hit was a mere 73C, and that’s only after a fair bit of work. During desktop use though it’s entirely silent. That’s because when the GPU is running at less than 65C it’s more than happy to operate with the EVGA ACX 2.0+ cooling working in passive mode alone—that means no spinning fans, and no noise. Even when those fans do spool up though the ACX 2.0+ cooling array is seriously quiet in-game. The memory architecture is the standout news from the GeForce GTX 960 spec sheet. It's got 2GB of GDDR5—the bare minimum for a gaming graphics card these days, and a 128-bit memory bus, which could be a problem. The now-familiar refrain from Nvidia is that they've got some funky new memory algorithms which make a mockery of such concerns. The Nvidia 128-bit bus is still able to deliver a total memory bandwidth of 112GB/s and with the new memory compression techniques that goes up to an effective 149GB/s. That is still short of the 192GB/s memory bandwidth of the 256-bit bus in the GTX 760 however, but beats the 144GB/s of the GK 106 GPU in the positively geriatric GTX 660. It's possible that if the GTX 960 had been released with the same 256-bit bus as its Maxwell brethren then 960 SLI setups could have cannibalised Nvidia's recent single-card solutions. A pair of 960s is still a potent force, beating a GTX 980 in some benchmarks. But for beyond-1080p resolutions even two of 128-bit memory buses can't help. As a mid-range 1080p gaming card the EVGA GTX 960 SuperSC performs exactly as you would expect it to. I’m saying that only because we’ve already got similarly priced cards performing at almost exactly the same levels. Sapphire’s Radeon R9 285 Dual-X is around the same price as EVGA’s seriously overclocked GTX 960 and the two match each other blow for blow in benchmark terms. I’ve also got my hands on an Asus STRIX GeForce GTX 960 OC Edition, which doesn’t quite go as far as the EVGA in terms of clockspeed. But that doesn’t actually seem to matter much in terms of gaming performance. Even though this EVGA card is clocked a good deal higher than the Asus—the SuperSC is hitting 1,430MHz versus the STRIX at 1,354MHz—there's only a tiny difference in FPS terms. That’s going to make it tougher to justify the purchase of an expensive overclocked card like either the Asus or this EVGA GTX 960 SuperSC. With a decent cooler most GTX 960 cards are going to be capable of hitting almost identical levels of performance with a little light overclocking. Despite the fact AMD don’t seem to have released a new GPU in the last epoch, there is one other card vying for attention in this arena: the R9 280. The Tahiti Pro GPU at its heart may be three years old now, but because it was a top-end card of its time it’s rocking a 384-bit bus and 3GB of GDDR5 memory. And it’s considerably cheaper than the GTX 960. But I still wouldn’t recommend you buy that card over either the R9 285 or any GTX 960. The memory architecture is tempting, but if you’re not looking to stray beyond the bounds of 1080p gaming any time soon you’re much better off with either of the two more modern cards. On the AMD side you get access to the upcoming FreeSync monitor technology as well as the Radeon version of GPU clock boosting. With the Nvidia card you get access to their monitor syncing tech—G-Sync—as well as a host of other proprietary technologies. One of the key ones Nvidia have been keen to talk about around the GTX 960 launch is multi-frame anti-aliasing (MFAA). We spoke about this at the launch of the GTX 980 where it was first introduced, but essentially it’s a new method of anti-aliasing which approximates 4x MSAA by alternately using different 2x samples. MFAA then offers almost identical visual fidelity to 4x MSAA with the performance hit of only 2x MSAA. Unfortunately it doesn’t work with every game, but where it does you’ll see a bit of a performance boost without a visual hit. It’s also synced with GeForce Experience, so you don’t necessarily have to spend ages digging around to set it up. These are all just value-added extras though, and it has to come down to which card performs the best. Overall I think the GTX 960, especially in this beefy EVGA SuperSC trim, just about has the edge over the Radeon R9 285. But it’s a close run thing and I’d argue anybody buying either card for a top 1080p gaming PC wouldn’t regret their purchase. But that still doesn’t make the GTX 960 particularly exciting. People are unlikely to go rushing out to ditch their existing GPU to make way for a GTX 960. No-one’s going to be trolling AMD forums shouting about their GTX 960 setup. That won't stop it from selling an absolute shed-load. For the mid-range upgrade market it’s one of only two cards you’d look to for a powerful 1080p gaming rig. So, functional? Hell, yes. Exciting? No.